Three Cup Chicken is a popular Chinese dish that is made by braising chicken in 1 cup of rice wine, 1 cup of soy sauce and 1 cup of sesame oil. And that’s supposed to be the recipe I’m making and blogging today. Well, I Googled numerous Three Cup Chicken recipes, some used equal amounts, some reduced the soy sauce and sesame oil, some replaced the rice wine with Shaoxing etc. In an attempt to be a little more health-conscious, I tried the recipe with reduced soy sauce and sesame oil. I had to use Shaoxing as I don’t have rice wine on hand. I’m not sure if it’s the wrong ratio, or the wrong use of wine, or the lack of Thai basil / spring onion, but the resulting chicken doesn’t taste like Three Cup Chicken at all. Thankfully it still tasted yummy, so I changed the name of the recipe and this is what we have today, a blessing in disguise I guess! 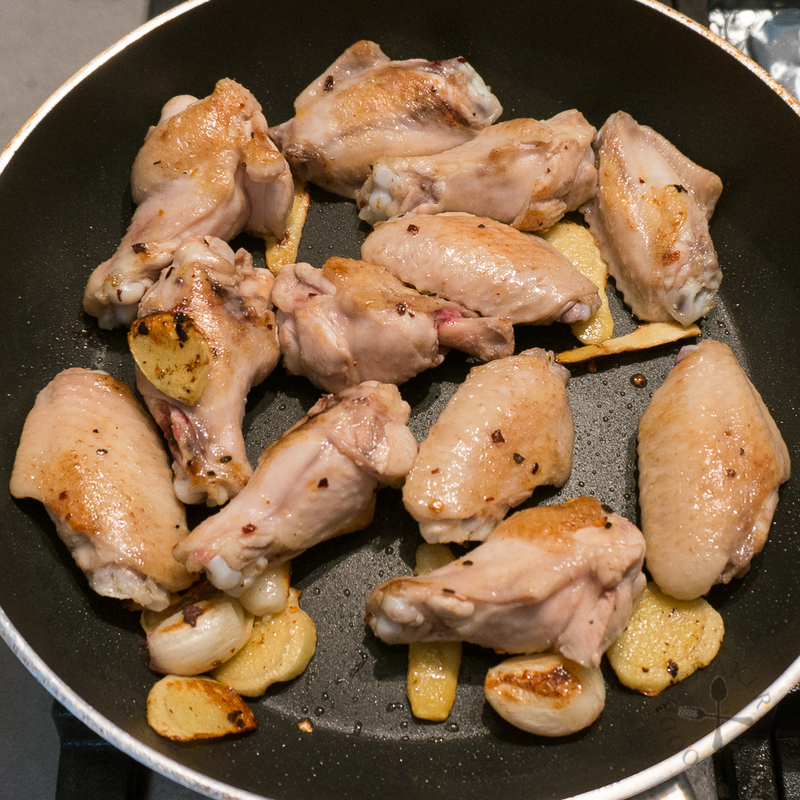 This dish can be easily made in 30 minutes (cooking time) – longer time will be needed if larger chicken parts are used. I blanched the chicken wings to remove scum and blood before cooking the wings proper. 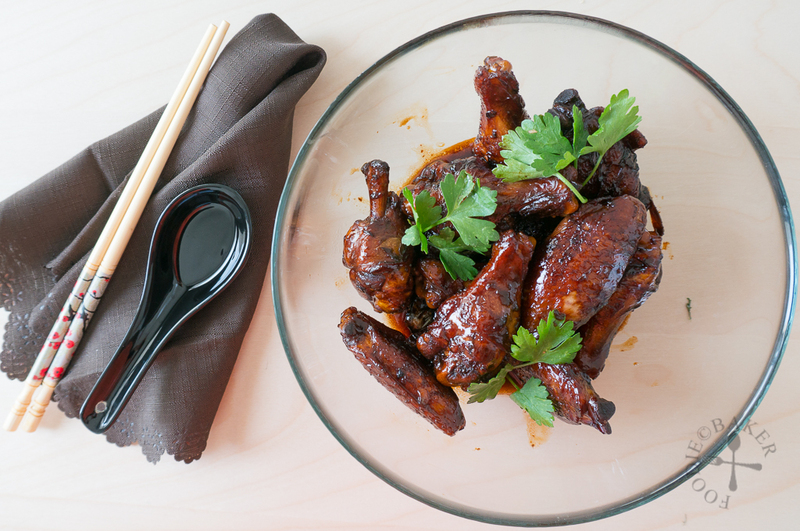 After a brief simmer in an aromatic and flavourful combination of spices (ginger, garlic and chili), Shaoxing wine, dark soy sauce and sesame oil, rock sugar is added, which gives the sauce a slight hint of sweetness and to give the wings a pretty shine – who can resist not digging in? And here’s how to make them! 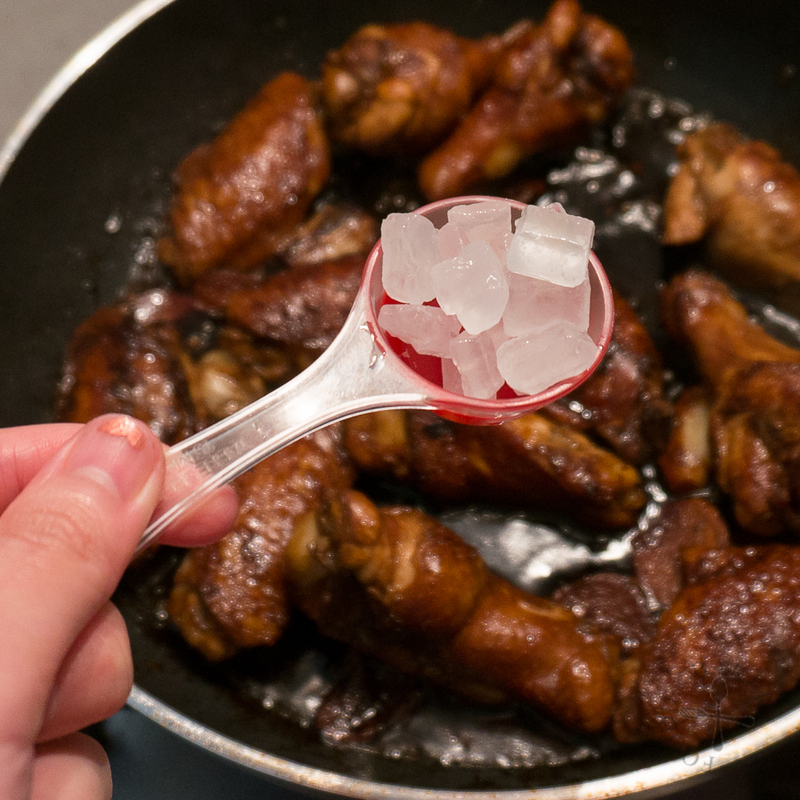 1) Blanch the chicken wings to get rid of scum and blood. 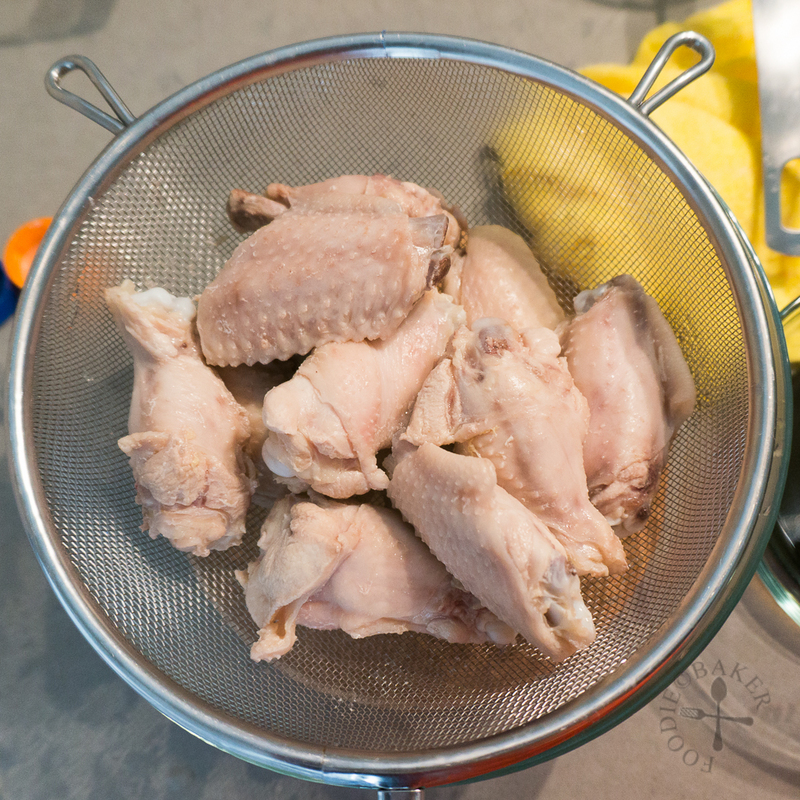 2) Drain and rinse the chicken wings well. Drain again. 3) Heat a little oil and add in ginger, garlic and chili flakes. Fry on gently heat until fragrant. 4) Add in the chicken wings. 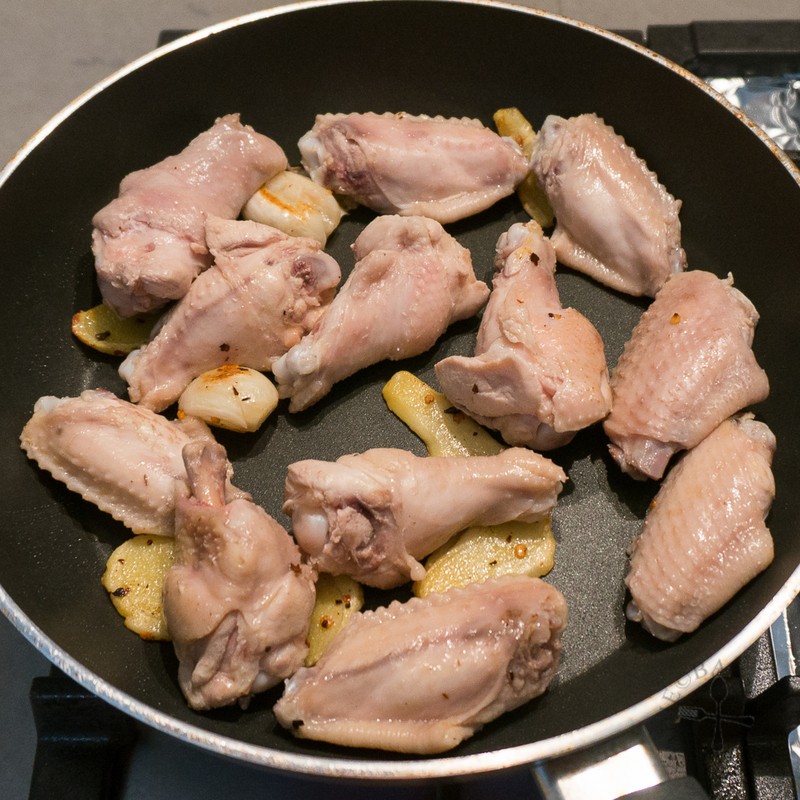 5) Fry the chicken wings until lightly browned. 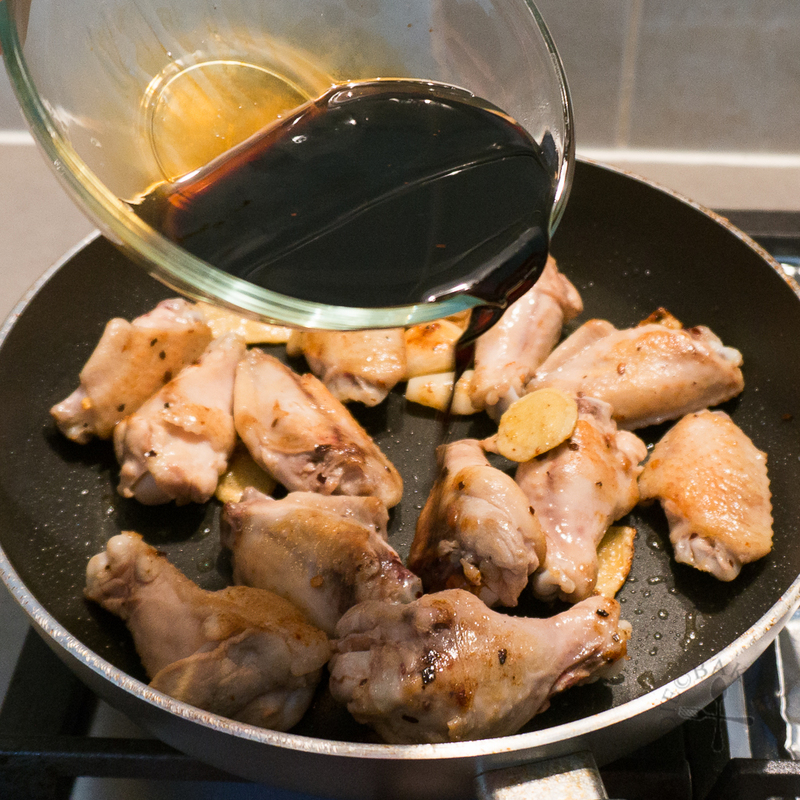 6) Add in the sauce - a combination of rice wine, dark soy sauce and sesame oil. 7) Cover and braise for 10 minutes. 8) Add in the rock sugar. 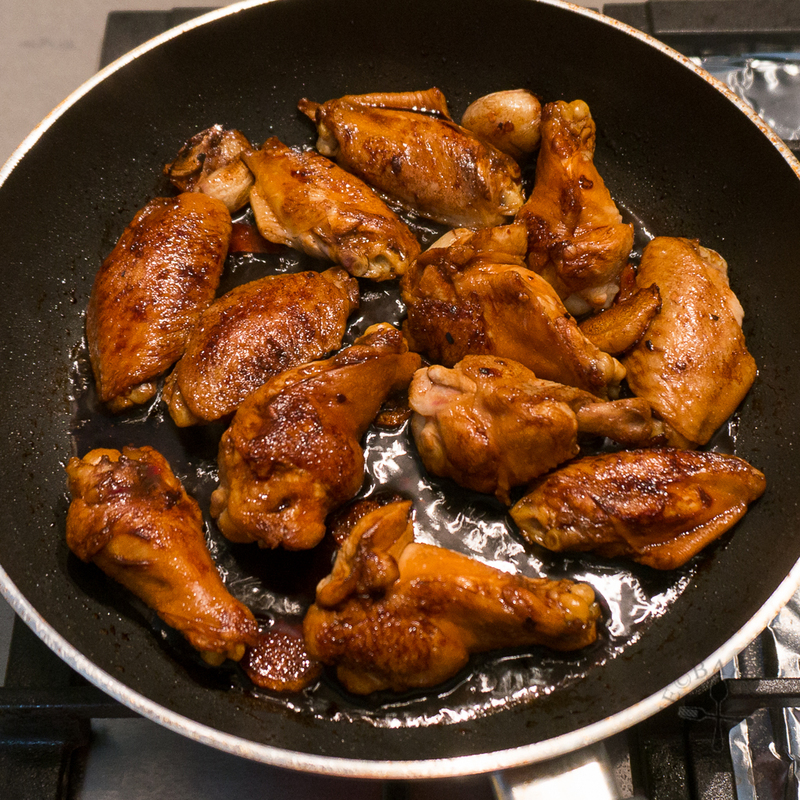 Flip the chicken frequently for another 5 minutes, until the sauce thickens and the wings are coated in a shiny coating. 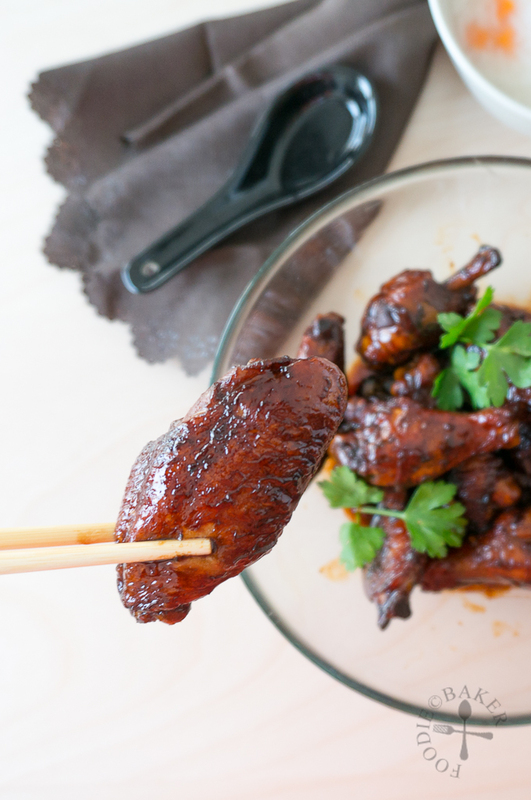 Chop chicken wings into drumlettes and winglettes. 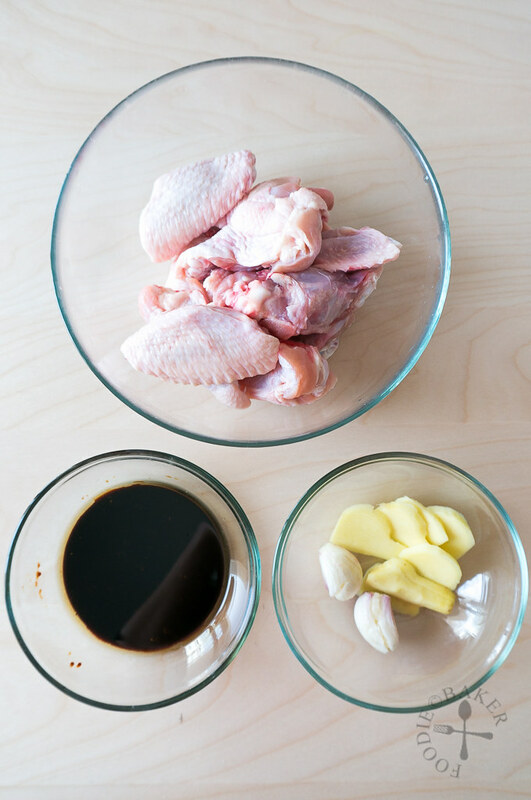 Chop off the wing tips and freeze them to make stock. Rinse the chicken well and pat dry thoroughly with paper towels. Heat oil over medium heat in a non-stick frying pan (you may need more oil if using a wok). 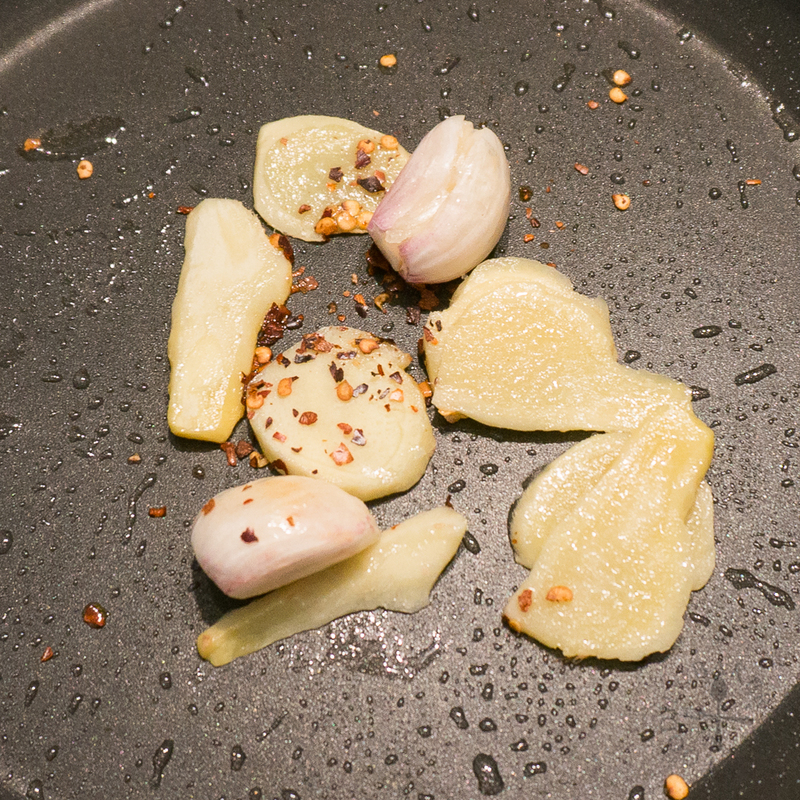 Add in the ginger, garlic and chili flakes and sauté for a few minutes until fragrant. Turn up the heat, add in the chicken and stir-fry until lightly browned, about 5 to 7 minutes. Add in the wine, soy sauce and sesame oil. The sauce should start to simmer right away. If not, bring to a boil then turn down the heat. Cover and simmer for 10 minutes. Remove the cover and add in the rock sugar. Turn up the heat to medium. Keep stirring the chicken until the sauce thickens and coats the chicken, giving the chicken a nice dark and shiny coating. Serve hot with rice or porridge. - You can use dried or fresh red chili instead of chili flakes. To use dried chili, rehydrate them in boiling water for 15 minutes before using. Will try this delicious wings!! Love these chicken wings look anazing Jasline!! They are indeed! Thanks Raymund! Hi Zoe, yes it certainly will be! Super yummy! I love this dish! Yummy! I know this is so delicious! 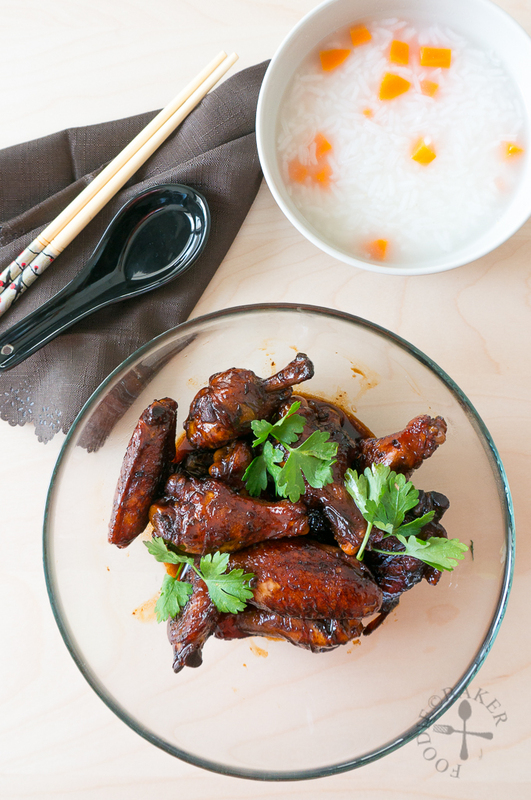 Your braised soy chicken wings look super delicious! Love the beautiful colour too.